Posted September 30, 2016 by The Rapid & filed under Places to Go. Ah…autumn! Bring on the crisp weather, sweaters and falling leaves.Get the most out of the month of October by packing your event calendar with fun things to do. Ride with us to enjoy the last week of ArtPrize Eight! Grand Rapids’ transformation into a giant art gallery last until Oct. 9. Enjoy art of all kinds and a chance to explore parts of downtown Grand Rapids you may have never been to before. Get outside and explore this month! Blandford Nature Center has several events worth checking out. Falling Leaves takes place on Saturday, Oct. 1. Individuals of all ages can join a naturalist for a walk through the forest to identify common Michigan Plants. Following the hike there is a craft for kids. There’s also Blandford’s Harvest Festival, hOWLween at Blanford and more! Route 7 can get you there. Plan your trip. Join Ghosts of Grand Rapids authors for an evening of Grand rapids history mixed with the paranormal world. Ride The Rapid to get to Veteran’s Memorial Park for this $10 walking tour that will get you in the mood for Halloween. Route 1, 4, 14, 15 and the Silver Line can get you there. Plan your trip. Visit the Grand Rapids Children’s Museum for family night! Admission is just $1.75 for this drop-in collaborative family art program. You and your family can create art to take home with you! Recurring weekly on Sunday, Tuesday, Thursday, this free tour lets you inside the famous Frank Lloyd Wright house located at 450 Madison Avenue SE. Take a step back in time to enjoy the beauty of this unique home. Routes 3 and 5 can get you there. Plan your trip. The Grand Rapids Art Museum has partnered up with AM Yoga to bring you this awesome event. Come out on Thursday evenings for Vinyasa-style yoga classes for all levels. Admission to the GRAM is free and you can ‘pay as you please’ to support yoga in the community. Routes 6, 9, 11, 13, 50 and the Silver Line can get you there. Plan your trip. 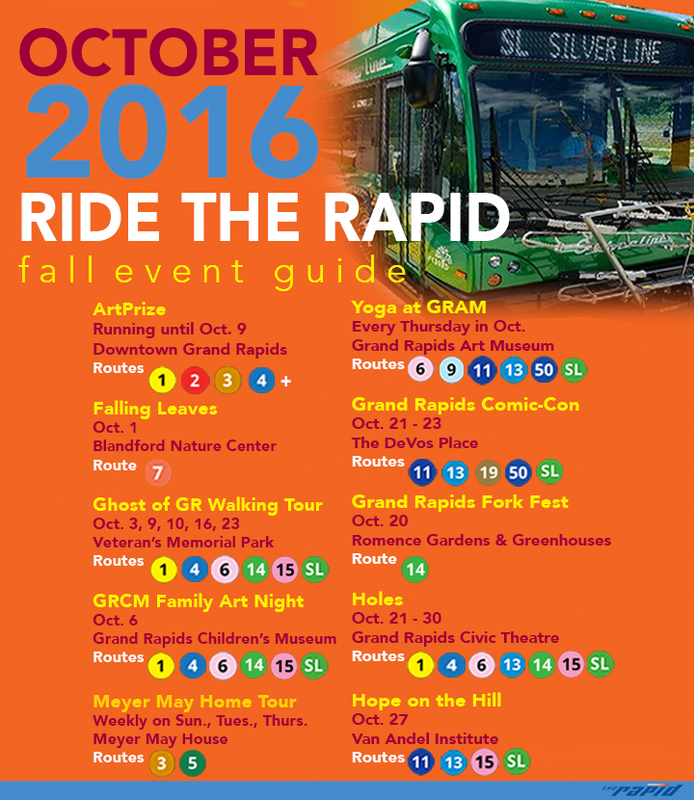 Ride with us to DeVos Place from Oct. 21 – 23 for Grand Rapids’ very own comic and popular arts convention. Day tickets and weekend packages are available. Routes 11, 13, 19, 50 and the Silver Line can get you there. Plan your trip. On Oct. 20, get on board and ride to Romence Gardens & Greenhouses for the 6th Annual Fork Fest. This Local First event offers attendees a chance to sip, nibble and munch on offerings of more than 40 of West Michigan’s finest restaurants, farms, grocers, bakeries, breweries and more. Route 14 can get you there. Plan your trip. From Oct. 21 through Oct. 30, don’t miss this beloved book-turned-production at the Grand Rapids Civic Theatre. Journey with the main character to his strange life at a camp for troublesome boys to uncover a mysterious plot. Individual tickets range in price from $10-$16. 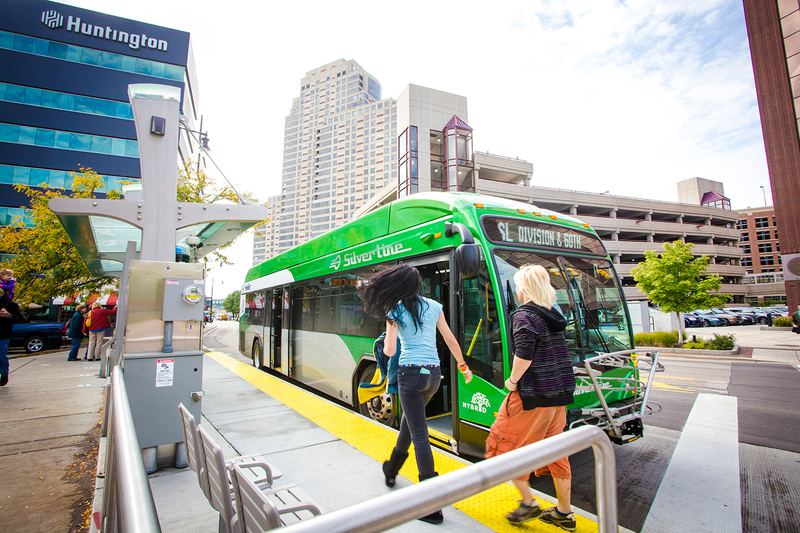 Routes 1, 4, 6, 13, 14, 15, and the Silver Line can get you there. Plan your trip. Celebrate Van Andel Institute’s 20th Anniversary on Oct. 27 with the 2016 Hope on the Hill Gala. The theme is The Great Gatsby, so get ready to enjoy a taste of the Roaring Twenties. Sample cuisine from Grand Rapids’ finest restaurants and catering companies. Enjoy live entertainment, dancing and knowing you’re helping support biomedical research and science education programs. Routes 11, 13, 15 and the Silver Line can get you there. Plan your trip.